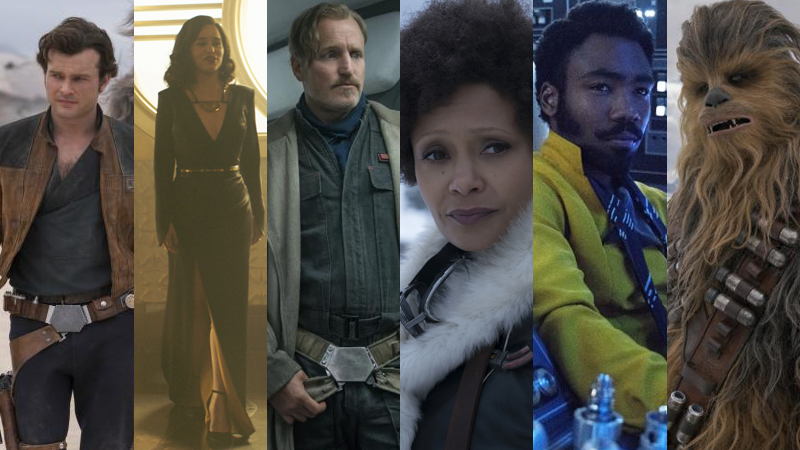 From left to right Han (Alden Ehrenreich), Qi’ra (Emilia Clarke), Beckett (Woody Harrelson), Val (Thandie Newton), Lando (Donald Glover), and Chewbacca (Joonas Suotamo). The story of that guy and his hairy pal is finally here! Would you like to chat about Solo: A Star Wars Story freely with other fans? Well, land that Falcon because you’ve just found the right spot! Just no arm-pulling, ok? So much has happened since Solo was first announced. Even those of us keeping up on the latest news didn’t know what to expect from this first solo character tale from Lucasfilm and Disney. Personally, I had fun, and probably more so since I lowered my expectations going in. L3 is now tied neck to neck for my favorite droid with Chopper. What a scene-stealer! More Enfys Nest stat!! And holy cow... that surprising cameo. Definitely wasn’t expecting that but as a fan of the animated Star Wars: The Clone Wars and Star Wars Rebels, I’m very interested to see what it will mean going forward in the film realm. We’ll have more on that next week, in the meantime, you can check out io9's review here. Otherwise this is your landing pad for all your spoilery thoughts and feelings! Have at it. Who wants to shower with a Wookiee?